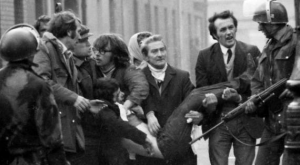 HUNDREDS of bikers will gather in Thurrock on Friday morning to protest against the prosecution of a British soldier over Bloody Sunday. ‘Soldier F’ is to be charged with murdering two people after troops opened fire on civil rights demonstrators in Derry in 1972. Over a hundred bikers are expected to gather at Thurrock Moto Services at just after 10am before making their way into London. The organiser of the ‘Rolling Thunder’ event, Harry Wragg, said the British government should not have allowed the prosecution. “Our ride is not directed at the victims, it is directed at the British Government,” he said. Thirteen civil rights demonstrators were shot dead on Bloody Sunday on January 30 1972, on one of the most notorious days of the Troubles. Soldier F will face charges for the murders of James Wray and William McKinney and the attempted murders of Joseph Friel, Michael Quinn, Joe Mahon and Patrick O’Donnell, the Public Prosecution Service has said.